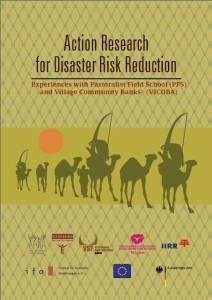 Action Research for Disaster Risk Reduction. Experiences with Pastoralist Field School (PFS) and Village Community Banks (VICOBA). This publication aims at sharing experiences on the concepts of Pastoral Field Schools (PFS) and Village Community Banks (VICOBA) as implemented by the VSF consortium (VSF- Switzerland, Belgium and Germany) in the ECHO funded Improved Community Response to Drought (ICRD) project. As part of the knowledge management process the documentation is expected to disseminate lessons learned among local authorities, humanitarian/development actors and decision makers. The intention is to communicate how such approaches can be used to share the experiences made in implementation and to measure their impact in regard to the communities’ ability to reduce their risk of disaster and to create sustainable development initiatives in drylands. Through the ICRD project, the VSF consortium has created an opportunity to consolidate good practices and lessons learned as presented in this document.